Over the past few years, WordPress pricing tables have been rising in terms of both use and popularity. These tables prove to be amazing additions to just any kind of WordPress website, particularly in case of premium services being offered or when it involves sale of products at multiple levels of tiers. They have become so popular that plenty of WordPress themes are now increasingly made available with the premium pricing tables. However, if you are really keen on adding pricing tables to your WordPress themes already in use then the following WordPress pricing tables may sound like an ideal solution. Here we are, with the most convincing collection of WordPress pricing table plugins. It is one of the amazing WordPress table plugins available. You can pick the colors of your choice for the pricing table. It is possible to generate unlimited number of columns and rows. This plugin can be easily put into use. This is also one plugin that allows you to enter actual width of columns and this doesn’t happen with various other free pricing table plugins available. It is also available with a Pro version and that would not cost more than 5$. Unlimited rows and columns, shortcode options, tooltip for addition of extra text, responsive designs, zoom effect, custom background and much more. Biggest advantage that this plugin has got to offer is that you can easily pick custom colors of your choice and put them into best use. It offers most essential features and if you are comfortable with it adding a link back on your website then you can go with it. However, the same links can be removed with its PRO version. If you can ignore this one disadvantage then this plugin can offer plenty of features that you simply can’t ignore. Unlimited rows and columns, width control, responsive designs, drag and drop columns, etc. Biggest advantages are its availability with 5 different table templates as well as the responsive designs. Free pricing table solutions are easiest to use. These pricing tables are available with three templates that include ‘gray’, ‘smooth’ and ‘green’. You can also enjoy the comfort of adding tables just anywhere; all you have to do is make use of a simple shortcode. Good thing is that it includes multiple features that are essential while creating pricing tables for services and products. Pro version is also available with 50 templates and lots of interesting additional features. Unlimited columns, drag and drop reordering package, tooltip support, templates and translation ready. Easy to use. All you need to do is create tables and then paste shortcodes. These are available with templates that can be customized to suit your specific requirements. They are also available with a convincing set of color schemes that are predefined in nature. This plugin can be easily setup and is easy when it comes to use. Since these are created with pure CSS, they can be comfortably customized to suit your website color schemes. Available with 6 different designs, responsive designs, unlimited number of columns, hover impact, multiple tables support on single page, CSS ribbons and drag and drop reordering. It supports use of pure CSS and templates that can be customized to suit specific user requirements. 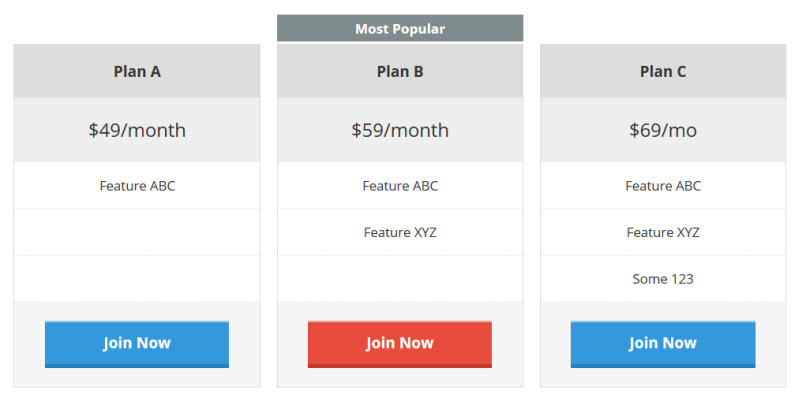 Other options to consider are Go – Pricing & Compare Table, CSS3 Responsive – Premium WordPress Pricing Table, etc. Each and every plugin has got something exclusive to offer that helps them stand out. Analyze and look for your own requirements first and select the most convincing option that suits your website. As a small business website design company we make sure to use many of the above plugins for our client’s websites.